Police said a California teen was reported missing after she disappeared after leaving a New Year's Eve party, CBS Los Angeles reports. Friends said 19-year-old Sarah Alarid was last seen arguing with her ex-boyfriend around 3 a.m. Tuesday in a Santa Clarita neighborhood, before taking off alone in a 2002 silver Ford Focus. Her father, Mike Alarid, said calls to Sarah's phone go straight to voicemail and there hasn't been any activity on it since 3:41 a.m. that night. "She's always called or we've always known where she's at. Or she's communicated with her friends. And that contact has just fallen off," he said. Sarah's mother, Laura Alarid, said the teen never goes longer than a day without calling. "She's my youngest daughter and I need her home," she said. "Please, Sarah, I need you home. I care about you a lot. We all need you here." 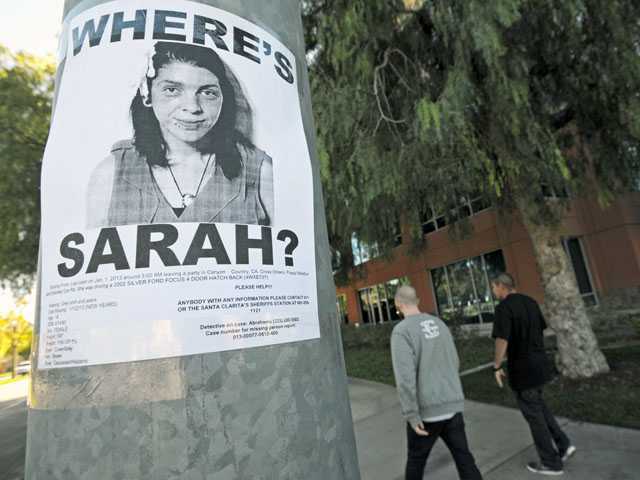 Volunteers, family and friends, including Sarah Alarid's former boyfriend, have been actively searching and passing out fliers around Santa Clarita since her disappearance, according to CBS Los Angeles. Alarid's friends said it is unusual for her to lose touch with them. "She knows that I'm one of her only friends that if she ever got into any trouble, I could come pick her up," said Jordan Carrico. "Didn't matter where she would be, I could come get her. But she hasn't tried calling any of us." Re: 19 yr old Sarah Alarid Missing: California teen last seen leaving New Year's Eve party, report says/Sarah's car found off cliff, body found ejected 300 yds away. Body confirmed to be Sarah's & ruled an Accident. Sarah Alarid Update: Is Foul Play Likely? Missing Santa Clarita woman Sarah Alarid still hasn't been located and fears for her well being are increasing among her friends and family. There aren't any investigative updates to share, but an update to the woman's description has been provided to the media, but there is also something curious about the investigation. The contact for reporting tips and information is the homicide division of the Los Angeles County Sheriff's Department—why? Do they suspect foul play in her disappearance or is this a normal procedure for Los Angeles detectives when a person goes missing? Sarah Alarid vanished in the very early morning hours of January 1st. She had been at a New Year's Eve party at a friend's home when she was seen leaving in a silver 2002 Ford Focus, four-door model. It's been well over 48 hours since she was last heard from, and this is undoubtedly sparking concern—but there is hope she could be somewhere on her own, unaware of the media attention her disappearance is attracting. The disappearance of this young woman is being reported alongside the disappearance of Petaluma woman Alyssa Byrne. Both of them are from California, and both of them vanished after attending New Year's Eve events. Unfortunately, the body of Alyssa Byrne was located on Friday, and Alarid remains missing. It's even more perplexing that the homicide division is handling her case. This is making it hard not to speculate that foul play could be a factor in her case. The updated description of the missing Canyon Country woman comes with a new photo of her that differs from others that are being shown in reports. She is described as having several tattoos, including one of a gun on one of her fingers. If you see this young woman, do not hesitate to contact local authorities to let them know whether or not she is safe. The search has continued into Saturday. If you have any information about this missing teen, please contact Santa Clarita Valley Sheriff's Station at (661) 255-1121, the LASD Missing Persons Unit at (323) 890-5500. If you prefer to provide information anonymously, you may call "Crime Stoppers" by dialing (800) 222-TIPS (8477), or texting the letters TIPLA plus your tip to CRIMES (274637), or by using the website http://lacrimestoppers.org/. (Update) MiSSING: Deputies Search For 19-Year-Old Canyon Country Teen, since New Year's, Santa Clarita: Sarah Alarid, 2002 Ford Focus, silver, CA #4WXE737, 4-door, with a faded decal of the pink cancer ribbon on the left side of the rear window. 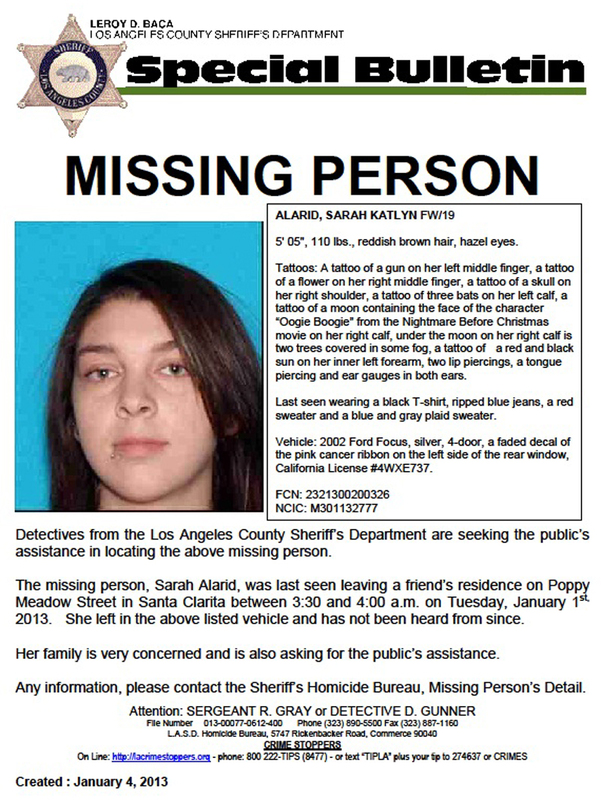 Sheriff's Homicide Detectives are continuing their investigation of missing teen, Sarah Katlyn Alarid, of Santa Clarita, who was last seen when she left a friend's home in the early morning hours of January 1, 2013. Detectives have searched several locations with the assistance of the Sheriff's Santa Clarita Valley Station Search and Rescue Team and the LASD Aero Bureau helicopter crews throughout the day, Friday, January 4, 2013. Detectives are currently conducting interviews and are following leads in the investigation. Anyone with information about this incident is encouraged to contact the Missing Persons Unit of the Los Angeles County Sheriff's Department at (323) 890-5500. If you prefer to provide information anonymously, you may call "Crime Stoppers" by dialing (800) 222-TIPS (8477), or texting the letters TIPLA plus your tip to CRIMES (274637), or by using the website http://lacrimestoppers.org/. Missing Persons Unit detectives from the Los Angeles County Sheriff’sDepartment are seeking the public’s assistance in locating 19-year-old, Sarah Katlyn Alarid. 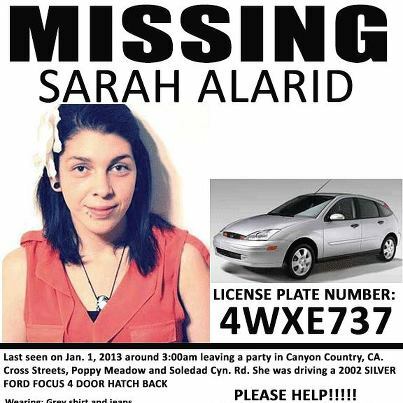 The missing person, Sarah Alarid, was last seen leaving a friend’s residence on Poppy Meadow Street in Santa Clarita between 3:30 and 4:00 a.m. on Tuesday, January 1st, 2013. She left in a 2002 Ford Focus, silver, 4-door, with a faded decal of the pink cancer ribbon on the left side of the rear window, California License #4WXE737, and has not been heard from since. Alarid was last seen wearing a black T-shirt, ripped blue jeans, a red sweater and a blue and gray plaid sweater. She is 5' 05", 110 lbs., has reddish brown hair and hazel eyes. Tattoos: A tattoo of a gun on her left middle finger, a tattoo of a flower on her right middle finger, a tattoo of a skull on her right shoulder, a tattoo of three bats on her left calf, a tattoo of a moon containing the face of the character “Oogie Boogie” from the Nightmare Before Christmas movie on her right calf, under the moon on her right calf is two trees covered in some fog, a tattoo of a red and black sun on her inner left forearm, two lip piercings, a tongue piercing and ear gauges in both ears. Her family is very concerned and is also asking for the public’s assistance. Anyone with information about this incident is encouraged to contact the Los Angeles County Sheriff's Department's Homicide Bureau, Missing Person’s Detail at (323) 890-5500. If you prefer to provide information anonymously, you may call "Crime Stoppers" by dialing (800) 222-TIPS (8477), or texting the letters TIPLA plus your tip to CRIMES (274637), or by using the website http://lacrimestoppers.org/. WOW! If Homicide is involved you can bet they suspect foul play. Last one to see her was the bf she was arguing with? The search is still on for 19-year-old Sarah Alarid, who was last seen leaving a New Year's party, according to officials. Detectives have already searched several locations with the assistance of the Santa Clarita Valley Station Search and Rescue Team and helicopter crews from the Los Angeles County Sheriff's Department Aero Bureau. Community members also gathered at the Vons grocery store near the intersection of Sand Canyon and Soledad Canyon roads to aid in the search this morning. Alarid was last seen leaving a friend’s residence on Poppy Meadow Street in Canyon Country between 3:30 and 4 a.m. Jan. 1, according to information released by the Sheriff’s Department Friday. She left in a 2002 Ford Focus, silver, four-door, with a faded decal of the pink breast cancer awareness ribbon on the left side of the rear window. The car’s California license plate is 4WXE737. It has not been seen since she left the party. Alarid was last seen wearing a black T-shirt, ripped blue jeans, a red sweater and a blue and gray plaid sweater. 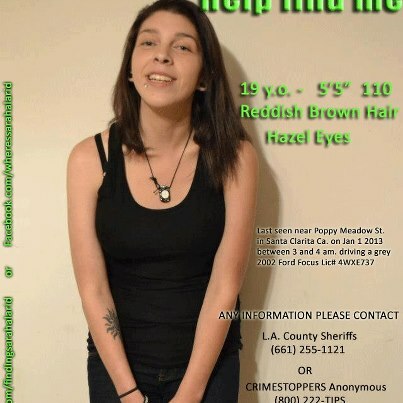 She is 5 feet, 5 inches tall, weighs 110 pounds, and has reddish-brown hair and hazel eyes. - a gun on her left middle finger. - three bats on her left calf. - gauges in both ears. Santa Clarita Valley Sheriff’s Station deputies scrambled to the area of Whites Canyon Road and Plum Canyon Road on Friday afternoon after receiving reports of a car matching the description of the missing woman’s Ford Focus, but the lead did not pan out, officials said. Anyone with information about Alarid’s disappearance is encouraged to contact the Los Angeles County Sheriff’s Department’s Homicide Bureau, Missing Person’s Detail, at (323) 890-5500 or the Santa Clarita Valley Sheriff's Station at (661) 255-1121. Information can be provided anonymously by dialing (800) 222-8477 (8477) or by using the website http://lacrimestoppers.org/. Here's another FB page dedicated to Sarah. Santa Clarita woman Sarah Alarid remains missing amid new revelations that she was last seen arguing with a former boyfriend. These new details aren't being discussed much in media reports, which is a curiosity considering this could be a vital piece of the puzzle. Statistically speaking, women are more often injured by someone they are intimate with than by a stranger—so when a woman vanishes directly after fighting with an intimate, this raises red flags. Dozens of the woman's loved ones held a search party for her on Sunday with no success. Neither Sarah or her silver Ford Focus have been located. It's been since the early morning hours of New Year's Day that she was last seen leaving, alone, after arguing with "a former boyfriend." Since he wasn't with her, that might eliminate him as being of any interest to this case—unless he followed shortly after she left, or if they fought over the phone and she left to meet him somewhere. You see, there are just not any easy-to-find details about the night she vanished. It would be nice to see some answers. A Facebook page has been set up by the family of Sarah Alarid in hopes of getting awareness out about her disappearance. They are 'friending' everyone they can who wants to share the flyers of the missing woman. In the meantime, searches for her continue but there aren't any investigative updates. Officials haven't acknowledged whether or not any evidence has been found in the search for this young woman, nor have any officials acknowledged whether or not any of her boyfriends have been questioned. SANTA CLARITA (CBSLA.com) — A vehicle registered to a missing 19-year-old Santa Clarita woman has been found Wednesday morning in a canyon in the Angeles National Forest, the Los Angeles Sheriff’s Department said. Sarah Alarid was last seen leaving a party in the Shadow Pines neighborhood of Canyon Country at 3 a.m. on New Year’s Day wearing jeans and a red sweater. Alarid reportedly had a tiff with an ex at the New Year’s Eve Party and left in her 2002 silver Ford Focus. Authorities discovered the vehicle in a ravine off Sand Canyon Road. The body of a woman was also found near the wreckage, however sheriff’s officials have not released her identity. Video at link, won't embed. This is so sad! I feel for her family so! The video above doesn't show the vehicle as well as another one I saw on the local news today. I don't know how far down that car went but it's totally demolished and they said the body is about 300 yards away. They haven't confirmed it's Sarah but they all but have. SAND CANYON (KTLA) – The body of Sarah Alarid, the Canyon Country teen who has been missing since New Year’s Eve, was found on Wednesday. Alarid’s body, and the silver 2002 Ford Focus hatchback registered to Alarid, were found 200 feet down a ravine off Sand Canyon Road near the Bear Divide Access Road and Little Tujunga Canyon Road. Investigators from the Los Angeles County Coroner’s office had been dispatched to the scene, along with LA County Fire andthe LA County Sheriff’s Department. Sarah Alarid’s parents Mike and Laura Alarid, who had gone to the scene of a reported shallow grave in Big Tujunga Canyon earlier in the morning, went instead to the scene above the ravine on Sand Canyon Road where Sarah’s car was recovered. The family members had not yet seen the body in the ravine, but sheriff’s homicide investigators and coroner’s investigators made the positive identification. I know that stretch of road and it's VERY dangerous. I am sure you do, too, Raine. Am thinking she was possibly intoxicated and mad at the bf and was driving too fast and missed the curve. They w/do tox reports on her that w/show if she had any alcohol or drugs in her system. I would think her body is in the late stages of decomposition and animals may have gotten to her. This is HORRIBLE news!! Her poor family! That road is extremely dangerous when sober let alone if one isn't sober. Being nineteen she wasn't too experienced either. I wish people, no matter what the age that go to a party will stay the night before driving a road like that. I looked for a picture that shows the road from above, everyone would be able to see how dangerous it is. This is just so sad! It has been very cold in the valley at night, low 40's, high 30's so I don't really know how the decomposition would go. Yes, there are lots of animals in that country. So sad. Good point about the decomp. (CBS/KCBS) SANTA CLARITA, Calif. - A vigil was held Wednesday night for California teen Sarah Alarid, whose body was found that morning in a canyon in the Angeles National Forest, CBS Los Angeles reports. Alarid, 19, had been missing since early New Year's Day, when friends saw her argue with her ex-boyfriend at a party in a Santa Clarita neighborhood, before taking off alone in a 2002 silver Ford Focus. Authorities reportedly discovered the vehicle in a ravine off Sand Canyon Road, where it had plunged down a 350-foot drop. Shortly after, Alarid's body was found near the wreckage. Alarid's uncle, who spoke to reporters at the scene, said the crash site was only about ten minutes from the party's location, CBS Los Angeles reports. "She used to like to come up here and hang out 'cause my brother's fire station is right up there, above where the scene is and she could have gone up there just to hang out," Bryan Alarid said. Toxicology reports will reportedly determine if alcohol was a factor in the crash. Foul play is not suspected. Wednesday evening, Alarids' family and friends gathered for the vigil in Canyon County to mourn. The teen's teary mother spoke to her daughter's friends and remembered her child. "We love you. We'll always love you. We'll never forget you." The Sheriff's Department has placed a "security hold" on information about a Santa Clarita woman whose body was found Wednesday. That means the Department of Coroner won't make the results public once it completes an autopsy on 19-year-old Sarah Alarid, coroner's Lt. Larry Dietz said today. The Sheriff's Department referred inquiries on the hold this morning to Lt. Dave Dolson of the Homicide Bureau, who could not immediately be reached. Ordinarily, the coroner releases the cause of death as soon as an autopsy is completed. But law enforcement agencies can ask for indefinite security holds, which coroner's officials have said can last days or months. Alarid, who had been missing since leaving a party early New Year's Day, was found Wednesday morning next to her crashed car in a ravine off Sand Canyon Road in the Angeles National Forest. Dolson told reporters Wednesday it appeared her car had gone off the road and into a ravine and she had been ejected. He said there didn't appear to be any foul play. Dolson said witnesses told detectives Alarid was drinking at the party, but he did not provide more detail. The cause of the crash was to be investigated by the California Highway Patrol. The Los Angeles County coroner has officially ruled Sarah Alarid's death an accident five days after the 19-year-old Canyon Country woman was found near her crashed car in a ravine. Ed Winter, an assistant chief coroner, said Monday an autopsy showed Alarid died of "multiple blunt force injuries" from a car accident. She went missing New Year's Day, when she was last seen leaving a party. Friends and relatives spent more than a week looking for her until sheriff's deputies in a helicopter on their way to another call spotted her car early Wednesday off Sand Canyon Road in the Angeles National Forest. Her body was found near the car, having apparently been ejected after the car went several hundred feet down a hillside off the windy road. Because detectives were initially unsure whether Alarid's death was related to a shallow grave found in Big Tujunga Canyon, they placed a "security hold" blocking the coroner from releasing any information about Alarid last week. But after investigating, detectives said they didn't believe there was foul play. They lifted the security hold and and turned the crash investigation over to the California Highway Patrol. A spokesman at the CHP's Newhall office said the cause of the crash is still being investigated. Winter said the results of toxicology tests on Alarid won't be available for at least a month.